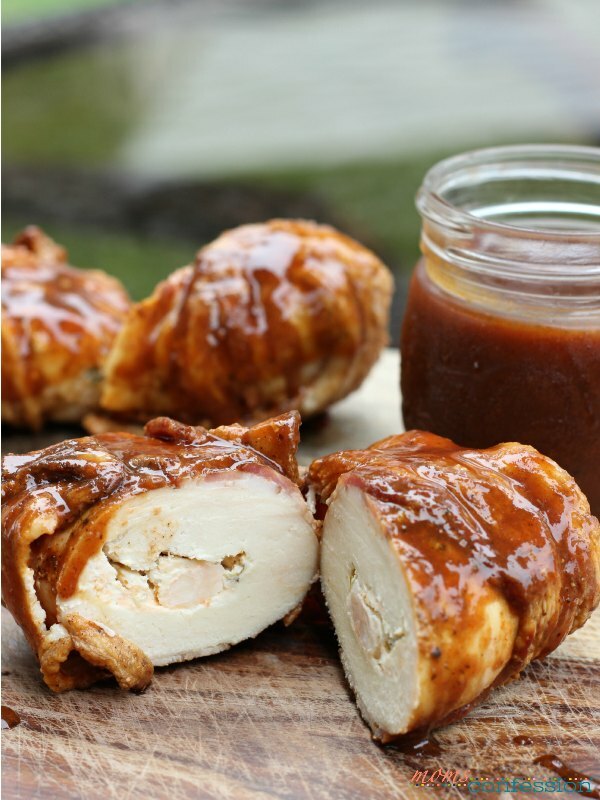 Home » Chicken Bombs with a Texas Twist! By Kristi · 8 Comments · · Disclosure: This post may contain affiliate links. Using an affiliate link means, I might earn a commission from any purchases through that affiliate link. Are you ready for a chicken dinner recipe that will knock your socks off? If so…I’ve got the perfect recipe for you! It’s Chicken Bombs with a spicy Texas twist! There really is no other way to describe this recipe…you just have to try it yourself! So put a spicy Texas twist on a traditional chicken bomb recipe and enjoy this easy family dinner recipe tonight! After 10 minutes of grilling time, baste with barbecue sauce before turning. Slice into 1/2-1 inch slices and ENJOY! I know there are bound to be many other ways to check this, but here are 3 ways you can make sure your chicken dinner is done. Use a fork and poke chicken bomb in the center and if the liquid runs clear, you are in the clear! 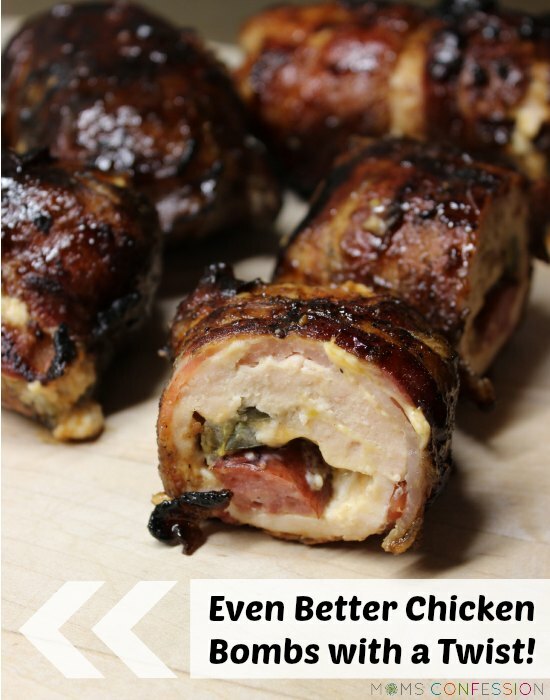 There you have it…my TX twist on a traditional chicken bomb recipe! 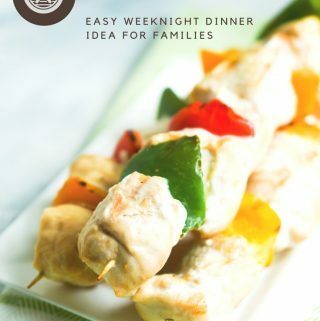 While it seems like a lot of work to enjoy this recipe, it is VERY simple to make for your family since you can prep most of it the night before and have it ready to grill in no time! If you think this looks amazing…share it with your friends and family or pin it to Pinterest so you can easily access the recipe when you’re ready to cook it each and every time! Try our newest Chicken Bomb Recipe…Even Better Chicken Bombs! Bacon Wrapped Chicken never tasted SOOOO good! You have to try these chicken bombs stuffed with shrimp too! Kristi, these chicken bombs look so delicious! My family loves spicy food. I cannot wait to try these for dinner! You have the BEST recipes on your site! Thank you Jessica! I’m so excited you love the recipes I share and are also anxious to try these Chicken Bombs. 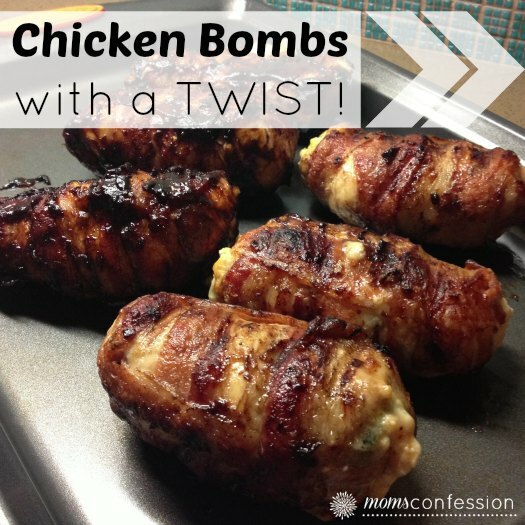 My husband and I just revamped the recipe here: https://www.momsconfession.com/even-better-chicken-bombs/…hope you will try them as well! I prefer Cajun Kisses. Made with a large Jalepeno, flattened Chicken Fillet very small, Monterey Jack Cheese in the middle, wrap a piece or 2 of Bacon around season with Cajun Spice, put 1 or 2 toothpicks through and grill or bake in oven on 350° until done. Awesome taste, the outcome was great!!!! Glad you enjoyed them David! Hi Mary! You can easily bake these in the oven. Simply bake them at 350°F for 25-30 minutes and they should be perfectly done. You will want to baste them with the bbq sauce as listed in the recipe as well.